I am disgusted and felt sick to the stomach to hear the barbaric murder of the former Saudi journalist who had fallen victim at the hands of the Saudi security apparatus inside the Saudi consulate in Turkey. What kind of human being would do such a thing, I wonder. What had upset me the most was to hear the alleged conspirators to be directed and incorporated by the highest ranks of the Saudi government, an entity that was supposed to be leading examples of Islam and Muslims. As the details of this barbarism are emerging what will be the perception of the general public towards Arabs and Muslims? I cannot believe diehard followers of the Wahhabi school of thought will have the audacity to identify themselves with any sign of this narrow minded brand of faith, or even bother teaching propagated heavily by the kingdom to have Muslims killing one another. The sad thing of all of this was to see the reaction of the United States government in trying to justify the heinous crime which makes even the devil shy from committing. How can the Saudi regime and their followers expect to retain the slightest trust in the Muslim world? How can they have face to show to the rest of the world? What I am really afraid of is to have the entire world doing nothing to hold those responsible to account. It is scary and worrying at the same time to see the status of our world community. In our native lands in Africa and the so-called third world countries, rich and powerful can get away with anything even murder. I wasn’t expecting to see the same thing on the world stage and with the blessings of the international community. All the political commentators have said the same thing. Money will be the decisive factor. Money will talk and everyone will listen. Money does indeed talk in the language everyone understand. Everything else will disappear in between. It is all the same whether in Africa or the US. When you have wealth the laws is on your side. At least Trump was honest in his initial assessment by saying that he was not going to compromise the defense contracts with the Saudi regime. In other word to hell with justice and all the nonsense phrases you keep hearing about human rights and justice. It is all an ink on a paper. 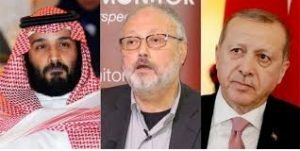 The case of Khashoggi is a wakeup call about the filth and corruption of this regime which has been supported by the west especially the US for its oil. It was instilled in the region by the British and since them it has been the illegitimate child of the west. To those young Muslims who are brainwashed by the kingdom’s school of thought, I hope this case will also help them to wake up from their delusion about the hypocrisy of the kingdom. They have no interest in Islam but rather they use it for their own interest to divide the believers. And to the rest of the world we ought to start learning about the history of the kingdom. It is the only country in the entire world which has hijacked an entire country and named it after a clan. They treated the whole country as a family enterprise. And to the western leadership including the honorable Canadian Prime Minister they should put an end of their hypocrisy in supporting ruthless regimes around the world and start acting with some sense of dignity. Enough of hypocrisy. It isn’t worth it. Life is too short. We ought to retain our human dignity and pass it on to our future generations.